Vegan Chocolate Chip Oatmeal Cookie Truffle Bars made with gluten-free ingredients and sweetened with dates for a delicious easy cookie truffle! We’re in full out holiday season friends aka we’re in a dessert marathon right now making and eating all the things over here. Not like it has to be the holiday season to make an epic truffle, but the dessert views on the blog skyrocket during the holidays so I want to make sure I have you guys covered with all the goods to choose from this year! 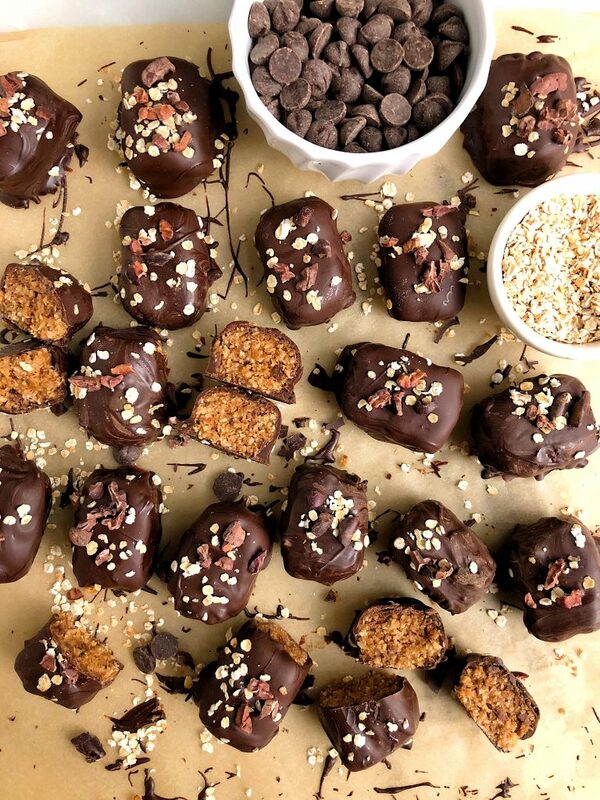 These Vegan Chocolate Chip Oatmeal Cookie Truffles are such a simple and easy dessert to whip up and make for friends as gifts, bring to a holiday party or get-to-together or just make for yourself when you are craving something real good. And the best part? These truffle bars call for 5 ingredients total, including the chocolate coating! It is insane how easy they are and they are no-bake, gluten-free and you can pop few in your mouth without feeling blah afterwards. What I also love about these truffles is the base of the truffle bar themselves. Remember those Peanut Butter & Jelly Snack Bars and Sweet Potato Chocolate Bars you guys loved so much? We are using another delicious mix from Creation Nation in this recipe just like those! 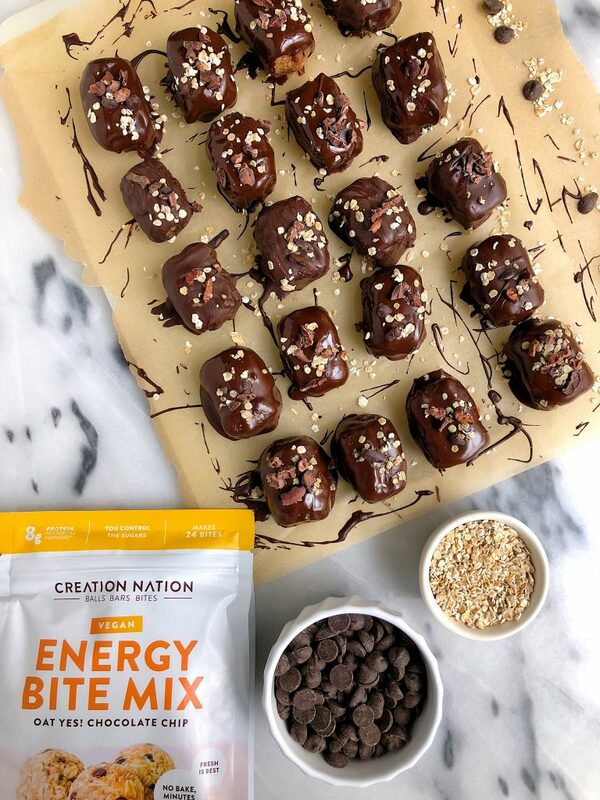 Creation Nation makes a line and delicious and healthy protein bar and bite mixes. Think baking mix except to make no-bake bars and bites or anything! The mixes are so versatile and fun to mess around with in the kitchen. 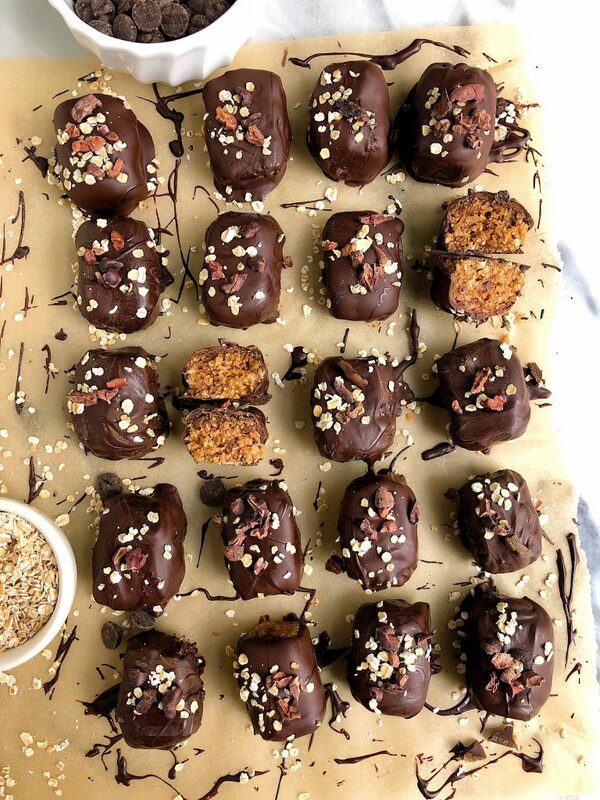 For these oatmeal cookie truffle bars, we are using the Vegan Energy Bite Mix – Oat Yes! Chocolate Chip. It is made with gluten-free rolled oats, organic shredded coconut, organic flaxseed meal and all ingredients you can pronounce. I added the mix to my food processor to make the mixing step even easy and to make sure the truffle bars center have oatmeal cookie flavor in every single bit. Just combine the mix with unsweetened applesauce, dates and coconut oil and that’s it! If you can’t find the Creation Nation mix near you, you can always order on amazon! You guys are going to love. Add to fridge to set for 30 minutes then serve and enjoy! Thank you Creation Nation for sponsoring this post! It means so much to me to partner with brands I love and believe in on the blog! I was at the mall earlier today with my wife and bought some truffles and ever since then I’ve been craving them even more! I think we’d have a lot of fun making this recipe, thank you!